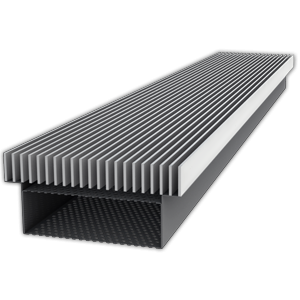 Floor displacement diffuser with trafficable bar grille. 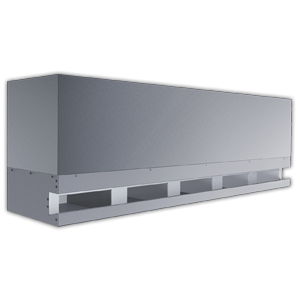 The SMARTEMP Bar Displacement Diffuser, type BDF-FD, is designed to supply air into rooms with raised floors. Air is spread evenly across a double-layer displacement cassette and oozes out of a heavy duty bar grille with minimal mixing, to produce a low velocity, low level lake of high quality supply air that floods the floor with displacement airflow. Velocities at floor level are low, to prevent draughts. A low level occupancy microclimate of enhanced indoor air quality is created, in which convective currents from occupants and other heat sources rise upwards, drawing in high quality replenishment air from the occupancy microclimate, to envelope these heat sources in cooler, high quality air. Heat and contaminants stratify at a high level in concentrated form, where they are removed from the space. Due to stratification of heat, relatively large supply-to-return temperature differentials are achievable – dependent on ceiling height – despite the relatively high supply air temperature (typically 19-20° C). Return air temperatures of up to 35° C may be achieved. Energy savings also accrue from the extended free cooling range typically achieved by the elevated supply air temperature, as well as from the potential to reduce outdoor airflow rates due to enhanced indoor air quality resulting from the improved ventilation effectiveness of the low level displacement supply. Thermal displacement airflow, with low velocity, low turbulence supply from the diffuser face into the occupancy microclimate. Heat and contaminants rise by natural convection to stratify at a high level. Enhanced levels of indoor air quality are attained in the breathing zone. Air supply from the floor. Suitable for VAV applications. Horizontal coverage dependent upon airflow rate. Nominal width: 100 mm, 200 mm or 300 mm. Nominal length: 1000 mm or 2000 mm. Bespoke sizes available on request. Bar grille with trafficable slats. Anodised or powder coated aluminium slats. The SMARTEMP Bar Displacement Diffuser, type BDF-FD, produces low velocity, low momentum displacement airflow that spreads horizontally across the floor. 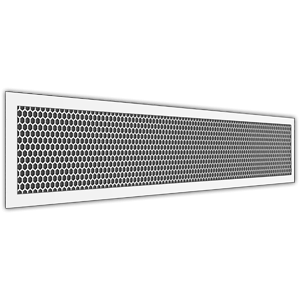 A perforated fixed damper, located behind the trafficable linear bar grille, produces uniform airflow with low turbulence discharge across the face. 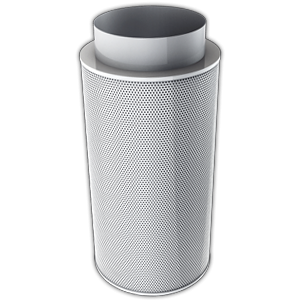 Air oozes from the diffuser with minimal mixing, allowing the high quality supply air to flood the floor with a cool lake of high quality. A low level occupancy microclimate of enhanced indoor air quality is achieved, in which thermals from heat sources such as occupants, equipment and lights rise upwards in convective plumes, drawing in high quality replenishment air from the fresh air lake, to envelop heat sources, such as occupants, in a micro-climate of cool, high quality air. Heat and contaminants stratify at a high level in concentrated form to be removed from the space. 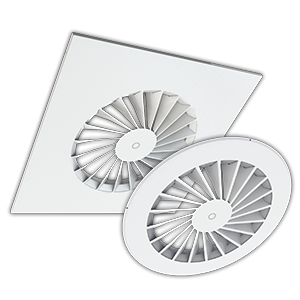 Due to stratification of heat, relatively large supply-to-return temperature differentials are achievable – dependent on ceiling height – despite the relatively high supply air temperature (typically 20°C), thereby minimising fan energy requirements. Energy savings also accrue from the extended free cooling range often achieved by the elevated supply air temperature, as well as from the potential to reduce outdoor airflow rates due to the the improved ventilation effectiveness of the low level displacement supply.